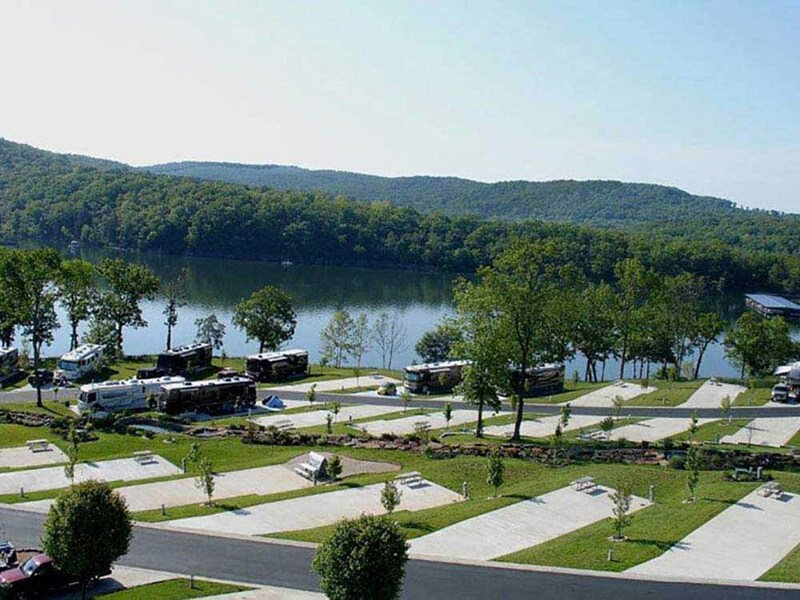 This is a beautiful RV Resort! First off, DO NOT USE GOOGLE MAPS to get directions. Definitely use the web site directions unless you enjoy off paved road excursions. Google took us down a road (Hwy 396) that turned into a single lane dirt road. It was harrowing since we had 7 large motor coaches pulling trailers and vehicles. It also had a concrete creek crossing for farm equipment that we had to cross. So please use the directions from the resort. Second, the resort is well thought out with ample space for parking trailers and spare vehicles by the activities building. Parking on our site was tight with our 44' RV with 4 slides and our truck but some sites were more improved than others. All sites are individually owned and improved but not all are rented to general public. They had a lot of water pressure and I would definitely use a pressure reducer. I had a hose split from the pressure. Third, we had a pull in site facing the lake, it was great! The golf coarse was in front of us on the side of the lake, the coarse was closed due to the massive flooding they had recently. They were working to clean up and repair the coarse. But the lake views and sunsets were breathtaking. Fourth, everyone was exceptionally nice and welcoming. All the site owners I met were happy we were there and very helpful and informative. Finally, it was a bit far to towns with stores and restaurants but the locals were great giving recommendations. We were there with friends for motorcycle rides around the area which did not disappoint. I hope to go back again, we really enjoyed our stay ! Amazing place, large level, full hookup sites. Great staff, lots to do. A marina is just across from the RV park. They will pick-up and deliver water toys. What a great experience. Staff friendly as it gets. Grounds immaculate... Not many places can you park a class A, have all the amenities and such a view A++++ We will be back! Thank you for such a great week! Awesome! THE nicest park we've ever stayed at. We found ourselves wishing we lived within a days drive so we could buy a spot. The largest individual sites we've ever stayed at. We stayed in a back-in site overlooking the 8th hold of the private golf course and the lake. Beautiful patio site behind the rig. Laundry room and restrooms sparkling clean. The clubhouse was fabulous!! Two pools, the clubhouse was our favorite. Definitely a little worried getting there...going down a lot of back roads with that "dueling banjos" playing in my head, but this was like finding the pearl in the oyster! We extended our stay as long as possible but wish we could've stayed longer. And the people there...SOOOOO friendly that we couldn't even get the rig set up before someone was carting my husband off in his golf cart to show him the best fishing spot! EVERYONE was so friendly. I can't say enough about our experience - but stay HERE if you're in this area!! Shades of "Deliverance" as we were driving to this place. It is definitely off the beaten path. Co-pilot thought I had lost my mind and my directions. But once you see the first welcome sign, WOW! This place is big rig Heaven. It's right on Table Rock Lake with great views. Wide parking spaces, beautiful landscaping, a 9 hole par 3 golf course. We rented a ski boat from the marina across the way (they came and picked us up) and spent the day on the lake. Staff was very nice and they have 24 hour security. The ONLY negative about the park is that there is no cable TV and we couldn't get any of the local channels. Other than that, I highly recommend Ozarks RV Resort. From jct US Hwy 65 & SR 86: Go 11-1/2 mi W on SR 86, then 1 mi S on SR 13/21, then 5 mi E on SR 311, then 1-1/4 mi E on CR 663 (R) Do not use GPS.